With little room for any further major infrastructure on the airport, Dubai Airports is joining forces with its key stakeholders to design product innovation and operational improvements that will deliver on the sector's ambition and ensure ongoing contributions to Dubai's economy. The focus of DXB Plus is to integrate the sector's efforts to meet airline demand and ensure a world-class customer experience from 'cloud to curb' – vital for delivering unconstrained sector growth. A cargo vessel loaded with commodities manufactured in China departed from Shenzhen for Dubai, a city on the southeast coast of the Arabian Gulf and an important stop on the 21st Century Maritime Silk Road. The commodities were mainly sci-tech products including computers and mobile phones, instead of the silk, chinaware, and tea exported to countries and regions along the ancient Silk Road thousands of years ago. There were also several containers with the Huawei logo loaded on the vessel. They carried Huawei's prefabricated modular data centre inside. After a month-and-a-half-long voyage, the vessel arrived at Jebel Ali Port in Dubai, the world's seventh largest container port. Very early the next morning, the cargoes and containers were unloaded and shipped to the final destination — the data centre construction site near Dubai International (DXB) Terminal 2. 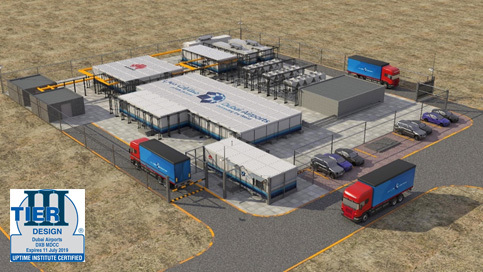 Technicians and engineers from Dubai Airports, Huawei, and Huawei's partner ALEC, had long been expecting the prefabricated modular data centre and had been making preparations over the past four months. This was, in fact, a very challenging data centre project. In recent years, driven by the rapid business growth, the eternal pursuit of a better passenger experience, as well as the increasing social responsibility of eco-friendliness and energy conservation, data centres have become an important part of Dubai Airports' digital transformation. Dubai Airports had several data centres, with devices provided by many vendors, complicated management, and limited cooling capacity. A new data centre, therefore, needed to be built to further expand airport services and consolidate services of the legacy data centres. The new data centre was designed to have 100 service cabinets, with up to 10 kW/rack in a single cabinet. To ensure high reliability, Dubai Airports expected to build the world's first Modular Data Centre Complex (MDCC) within a year that will be certified by the Uptime Institute to Tier III for design and construction. The 10 kW/rack power density requirement, plus the extremely high temperatures in Dubai, posed a greater challenge to heat dissipation; however, an appropriate building to house such a large MDCC wasn’t readily available. 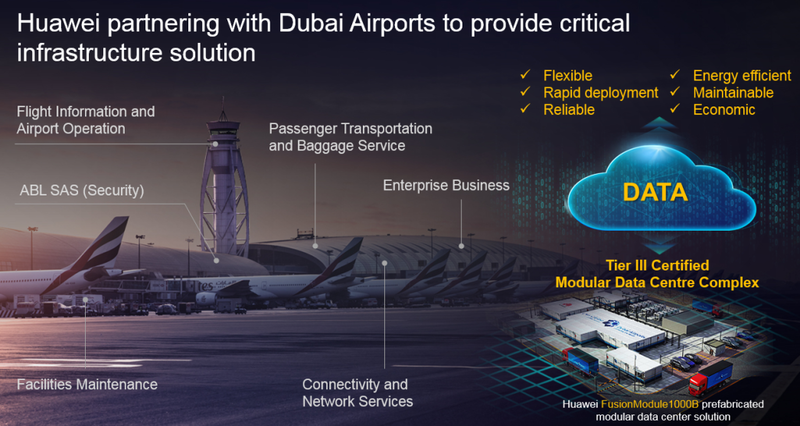 After thoroughly considering quick deployment, easy capacity expansion, energy conservation, and other important features, Dubai Airports chose Huawei's prefabricated modular data centre solution. Huawei's FusionModule1000B prefabricated modular data centre solution was adopted to build the new data centre for Dubai Airports. The solution consists of 23 container-sized prefabricated modules, equipped with in-row precision air conditioners and highly efficient modular UPS products. The total power is up to 1 MW. To obtain full Tier III certificates from the Uptime Institute for both design and construction, the data centre must ensure an availability of 99.98% and an annual downtime within 1.6 hours. The project was estimated to be completed in 10 months, meeting Dubai Airports' requirement for quick delivery and addressing the problem of lack of space for building a traditional data centre. The modular data centre solution saves nearly a half of the time and construction costs it takes to erect a traditional facility. Huawei FusionModule1000B adopts a wide range of cutting-edge data centre technologies to improve energy efficiency. The variable-frequency in-row air conditioner, highly efficient modular UPS, and aisle containment can reduce the designed power usage effectiveness (PUE) to less than 1.6, which is 30% lower than that of a traditional data centre. The design is also more adaptable to the intense hot weather in the Middle East. In addition, Huawei equipped the new data centre with the NetEco intelligent management system to simplify O&M and reduce management costs. The size of the prefabricated modules complies with ISO standards. Therefore, the capacity can be easily expanded by adding required modules. Compared with traditional data centres, this implements flexible expansion and saves the engineering costs and floor area. Dubai Airports has made sound plans and preparations to build such a large-scale data centre. Since 1960, DXB has grown into the world's number one airport for international passenger traffic and the one of world's largest logistics transfer hub. However, with the Expo Dubai 2020 approaching, the airport faces increasing pressure to perform more efficient and smooth operations. The annual passenger traffic of the airport is estimated to increase from 83.6 million in 2016 to 118 million in 2025. To meet rising customer expectations and accommodate ongoing growth in traffic, Dubai Airports has launched the DXB Plus program which aims to use innovation and technology to increase the hub’s capacity. Peter R Moore, Director of Development (Design) at Dubai Airports commented: "With little room for any further major infrastructure on the airport, Dubai Airports is joining forces with its key stakeholders to design product innovation and operational improvements that will deliver on the sector's ambition and ensure ongoing contributions to Dubai's economy. The focus of DXB Plus is to integrate the sector's efforts to meet airline demand and ensure a world-class customer experience from 'cloud to curb' – vital for delivering unconstrained sector growth." The MDCC at DXB represents an innovative masterpiece jointly created by Dubai Airports, Huawei, and other players in the ecosystem. The MDCC meets the information infrastructure requirements specified DXB Plus, helping Dubai Airports to achieve stable and efficient operations, as well as digital and cloud-based business over the next ten years. One of the world's most popular airport provides not only upgraded hardware infrastructure, but also an optimal customer experience. The International Air Transport Association (IATA) conducted a worldwide survey in 2016 to provide some references and suggestions for airports. The survey results show that 64% of the respondents prefer to board aircraft using electronic boarding passes on their mobile phones, 39% prefer electronic bag tags, and 61% expect to track their baggage throughout their journey, similar to the way courier companies allow them to track parcels. Also, 47% of the respondents hope the time for baggage drop-off can be limited to within one to three minutes, and 52% said their acceptable queuing time at immigration is between 5 to 10 minutes. Dubai Airports always puts customer experience first. The company attempts to optimize customer experience with a three-pronged approach: products, operations, and airport infrastructure. In terms of products, based on a deep insight into future trends, behaviors, and expectations of customers, Dubai Airports integrates products and services to deliver a consistent customer experience, and lead the innovation of future products and services that enhance hospitality and meaning full connections. As for operations, Dubai Airports aims to enhance the predictability of airport operations, ensure cost effective use of existing assets, provide a reliable, resilient, and streamlined process for each customer touch point, and ensure stress free journey for the varying customer types. Last but not the least, Dubai Airports will conduct customer-centric design and development of infrastructure and ecosystem, providing sufficient capacity to accommodate sustained airline and operator growth while maintaining the integrity of existing infrastructure. Smart Gates are deployed at DXB to speed up passport control procedures, facilitating smooth and swift entry and exit at the airport. A passenger holding an Emirates ID card or a biometric passport can bypass long queues and complete immigration process within seconds. The Smart Gate service saves passengers' time and helps the airport maintain smoother passenger flow. According to the Societe Internationale de Telecommunications Aeronautiques (SITA), cutting-edge technologies are needed to optimize Information and Communications Technology(ICT) systems, thus building a dynamic, efficient, collaborative, and innovative smart airport to accommodate future needs. How can we use new ICT technologies to support smart airport construction? For example, cloud computing and Big Data make airports more intelligent. Advanced network technologies ensure ubiquitous connections. LTE technologies help provide network coverage over the airports' airspace. The Internet of Things (IoT) supports interconnected and intelligent devices. With these new ICT technologies, all businesses will become digitalized while service levels rise. All these achievements are inseparable from data storage, transmission, and computing. In other words, all these cannot happen without data centres. CIO at Dubai Airports said "Technology is key to enhancing our ability to grow, innovate and ultimately enhance the customer experience. At the same time we will improve system reliability across both airports and cut operational costs. " With all these efforts, Dubai Airports will present an optimal customer experience and the highest levels of mobility, sustainability, and opportunities to visitors coming from around the globe to the Expo Dubai 2020, and show them what the world's best smart airport can offer.